What Equipment does JHRJ Provide? What Equipment will we need to bring? Can my children go on a river trip? How large are your groups? What about the food? WHAT KIND OF PEOPLE GO ON A JAMES HENRY RIVER JOURNEY? Our participants are diverse, interesting, adventurous people from all walks of life. They have ranged in age from one to eighty-four and join our groups traveling as singles, couples, groups of friends, families, and professionals. Good health and reasonable physical condition are the only prerequisites for our trips (see detailed Trip Profiles). Since you are wearing a Coast-Guard approved lifejacket, non-swimmers are welcome. Many who join our trips are first timers who thrive in their newly discovered world. 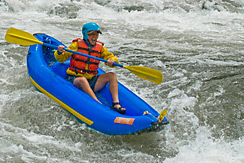 CHILDREN ON TRIPS: Most of our river trips are ideal for children. Minimum age is 7 on most California, Oregon, Idaho and Utah trips with the exception of highwater trips (Idaho), 14 on Tatshenshini trips (July and August departures only), 16 on Arctic trips. Just call to discuss your family situation before signing up. On Special Educational Programs (ie. Photography Workshops), please check with us before sending in a deposit for children who will be accompanying you who are under the age of 16. Maturity, outdoor experience, and the difficulty of the trip are key factors. Our river trips are managed by federal agencies and there are maximum numbers allowed in a group. As a general rule-of-thumb, our river trips group size averages twelve to fifteen guests. Our high ratio of guides to participants (one guide for four-five particpants) is ideal for safety, personal enjoyment and group interaction. We encourage you to form your own groups of friends, family, or professionals for our river journeys. On most domestic river trips (lower 48) we give a 10% discount to a group of 10 full-paying adult participants on the Rogue and Klamath Rivers. With 20 full-paying participants, we give a free trip to the organizer and a 10% discount to the group on selected departures only. Please inquire about our group discounts for our Alaskan trips. For full information and a group organizer packet, please call or e-mail our office. On all of our California and Oregon departures there is a special rate for youths age 17 and under (usually a discount of 10-15%). On some departures called "Special Family Discounts" there are additional reductions in the youth fare. On some of our Alaskan departures we also offer special family discounts. Please call or e-mail us for details. A number of our trips are offered through educational institutions and continuing education credit is sometimes available. Please write or e-mail for additional information. Check out our Guides and Facilitators in detail. Our expert guides are trained in first aid, CPR, and emergency rescue procedures and licensed by the Oregon State Marine Board, National Park Service, the Province of British Columbia and the Yukon Territory. Our affiliate companies' crew members are licensed by the Idaho Outfitters and Guides Board and the Oregon State Marine Board. We use the finest professional equipment and provide commissary, Coast Guard approved lifejackets, waterproof bags for your personal clothing, and waterproof boxes for cameras for all whitewater runs. On California and Oregon trips sleeping units (sleeping bags, rugged inflatable mattresses, and ground tarps) and tents are available for rental for the trip ($25 for sleeping units) and ($25 for tents-single or double occupancy). On Alaskan Tatshenshini River trips, 2-person Northface VE-25 tents are provided. These same tents are available for rental on our other Alaskan departures. Upon sign-up, we will furnish you with a complete equipment list assembled for the trip that you are going on. Essentially you bring your personal gear. On most of our river trips, we take different types of boats in order to give participants the opportunity to experience the river in a variety of ways. 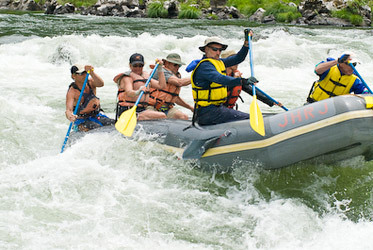 In a paddleboat (usually 15' long), six to seven participants work together under the guidance of an experienced professional to navigate the raft through the rapids. If we have six-seven individuals who want to paddle the majority of the trip, we will put a paddleboat on your Klamath, Rogue trips or Tatshenshini large departure (s) providing the water levels are safe to do so. When we offer out Arctic trips, on the Marsh Fork of the Canning or Hula Hula, they are all-paddle. On most trips participants commonly rotate in and out of the paddleboat in order to accommodate all who wish to be actively engaged. Oarboats (Avon Spirits and Avon Professionals are the supply rafts that carry food, group commissary and waterproof bags- usually 16-18' long - manned by one crew member, rowed with ten-foot oars and carrying three to four guests). Oar boats provide the opportunity to just relax and let the scenery go by or when conditions are appropriate to learn how to row flat water and rapids. On our Tatshenshini trips, additional power requires the combination of oar with paddle assistance from participants who are sitting in the bow of the raft. Oarboats are on every trip that we operate (except the Arctic Rivers which are all-paddle and inflatable canoe). 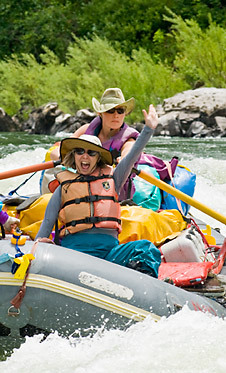 Self-bailing inflatable kayaks are available on our Klamath and Rogue trips for those who opt for an adventurous solo encounter with the rapids or a meditative drift through tranquil sections of river. You can't imagine what we are able to put together at mealtime on these trips! We're known for our exquisite wilderness cuisine and moveable feast. Our international camp cookery will fill the whetted appetite and satisfy the most discriminating palate. Some of our entrees include: grilled salmon with fresh herbs and a mango-papaya salsa, poulet a la moutarde on cous cous, chicken fajitas with tostadas, pasta primavera, and whole barbecued lamb marinated in exotic spices are among our usual entrees. Hors d'oeuvres, rice pilafs, pasta salads, rosemary potatoes, sauteed or steamed garden vegetables, Caesar salad, tossed salads, cole slaws, fruit salads, melon slices and a variety of dutch-oven desserts round out each meal. Fine wines are served each evening on all our Oregon and Klamath trips wine tasting departures. (See Special Trips). In Alaska, we serve wine on the Tatshenshini only. Beer is provided for our Mexican Fiesta night. On our Arctic trips, it is BYO. In Alaska, additional hearty entrees are served: flank steak and chicken marinated in a teriaki sauce, Thai chicken and vegetables in a green-curried peanut coconut milk sauce, halibut stew, pesto spaghetti, and a Dutch oven polenta dish au gratin. Lunches are buffet-style with a wide variety of salads; Greek, Nicoise, Tuna, Salmon, Thai Chicken, pasta salads, cold cuts, pita wraps, fruit, cheese, and juices. Breakfasts include eggs in all styles, including Huevos Rancheros, Eggs Benedict, eggs in the basket, tofu egg and vege scrambles; buttermilk blueberry pancakes, corn fritters, French toast, , coffee cakes, oranges, grapefruit, melons, yogurt, multi-grain cereals with dried fruit and nuts, coffee, tea and hot chocolate. Special dietary considerations: If anyone has any, please inform our office upon enrollment and well before the departure date. We can accommodate anyone. Vegetarians - we can accommodate vegetarians on all of our trips. Just let us know, well in advance of the trip, if you have any special dietary needs. River Trips - Rivers are rated by the technical difficulty of the rapid and we give each of our trips a grade so that you can choose which is appropriate for you. One must keep in mind that these ratings are only a guide-line since the difficulty of a rapid or the entire river is greatly affected by water level, water temperature, equipment, etc. Whitewater trips are graded on the international scale of I-VI: I-Easy, II-Medium, III-Difficult, IV-Very difficult, V-Extremely difficult, VI-Unrunnable. We operate on rivers that are Class II-IV. The river ratings listed in our website and printed material are based on the overall river, not on the most difficult rapid. If you have any questions about water flows or if you're unsure which river is best for yo and your friends or family, please give our office a call. Land-based trips or trips that have a walking component are graded "easy", "moderate", or "strenuous." Easy includes travel via conventional vehicles as well as short hikes of two to three hours or optional walks at low elevations. Moderate indicates hiking with a light pack over varied terrain for four to six hours per day at elevations between 2,000-12,000 feet. All of the trips that we currently operate are "easy" or "moderate." Our detailed day-to-day trip itineraries (trip profiles) include the conditions you can expect on the trip as well as suggestions for pre-trip conditioning. By operating a small company, we have been able to closely monitor who guides for us. We are also exceedingly cautious when it comes to your safety and our our record reflects it. We place your welfare above all other considerations. See Terms and Conditions and then Medical and Health. Prior to any raft trip, we assess water levels and before embarking, thoroughly explain our safety procedures; enroute we scout all rapids that require added attentiveness. Our trips are operated under permits issued by the U.S. Forest Service, Bureau of Land Management, Arctic National Wildlife Service, National Park Service, Provincial Parks of Canada, and the Yukon Territory. ©2002 James Katz. Revised, Feb., 2015. James Henry River Journeys. All Rights Reserved.